The Frame Clinch and other stuff I have stolen from Demetrious Johnson. In MMA the clinch position along the cage is practically another martial art in itself. None of the combat sports which make up MMA address the position as their rule sets do not usually allow athletes to smash each other into chain link fences. In the eyes of most judges, if an athlete has their back on the cage they are at disadvantage and are therefore losing that part of the round. When a fighter finds themselves in this predicament their fundamental athletic stance is disrupted, they cannot throw strikes with the same effectiveness and they must sprawl differently (wall sprawl vs ehm sprawl sprawl). The constant repummeling, wall sprawling, dragging guys up of your hips and efforts to turn off the cage make this area of the bout incredibly gruelling. Some of the most interesting developments in mma are happening with athletes working to use this unique environment to their advantage.. One such development comes from Demetrious Johnson who utilises a unique framing clinch along with the more traditional plum clinch to great effect in his bouts. Strikers clinch Vs Grapplers clinch. A grappler style clinch would be something like the over under or double under hooks positions. Here you are limiting the opponents ability to strike and gaining a great deal of control over the opponents body. The final aim is to hold the opponent and achieve a takedown. The strikers clinch differs from the grappler’s clinch in that there is always some form of barrier creating chest to chest separation. This again allows the athlete to limit the opponents ability to strike but also gives them the ability to effectively strike back. The Thai Plum clinch is a great example of this. Other examples are single collar tie for dirty boxing and any clinch where head position is used to create chest to chest separation. Demetrious Johnson is primarily a striker style clincher. He utilises the plum position excellently. He seamlessly enters into the clinch from punches and kicks and batters his opponents with knees to the body and head. Elbows and punches follow when they try to break away clean. But things get really interesting when you try and pin him against the cage as we saw throughout his bout with Ali Bagutinov. What was really interesting about this fight was DJ’s ability to be the more effective athlete even when his back was pinned to the cage by a much more powerful opponent. How did he do it? Well lets look at his Frame Clinch position. This position is characterised by two main features the bicep frame and the lat frame (as in on the latissimus dorsi muscle). The bicep frame is massively important and serves a number of purposes. Creates distance and angles: opponent cannot make true chest to chest contact. The shoulder of the bicep controlled arm is kept out. The space this creates will regularly filled with an onslaught of knees to the body. Prevents opponents hands connecting: its hard to think of a more effective takedown in mma than the double leg against the cage with the hands locked below the hips. The bicep frame prevents the opponent from connecting their hands in double unders or when dropping down to double leg positions. The opponent is forced to commit to the single leg and as we can see in the video at the end of this article DJ is rather good at turning his hip out of those. Opponent cannot use framed arm to strike: by monitoring the bicep you will no longer have to worry as much about strikes from that limb. While the bicep frame is pretty constant the Lat frame is more of a mobile trouble shooter, moving around to create space, defend takedowns and bash the opponent. The latissimus dorsi (side of ribcage/armpit area) tends to be the reset point but it can end up in a variety of positions depending on the aim. Creates space and angles: the hand on the lat helps the athlete to keep the opponents weight of them and allows them to slide the hips out along the cage to create angles, knee or move along the cage. Striking: As the arm is not trapped in an overhook the athlete is free to wing the framing hand over the top to strike the opponents head. This is not a knock out shot but it is annoying and can force the opponent to move. Transitioning to a single collar tie:by angling out with the hips, pulling on the opponents neck and framing on the bicep the athlete will be able to secure a single collar tie and a beneficial angle to strike or move of the wall. Transitioning to the head push knee: by angling the hips towards the lat frame side the athlete can push the opponets head into a knee strike. DJ does this a lot. Moving to an overhook to defend the level change: while the bicep frame prevents the opponent connecting their hands on the double leg the lat frame can transition to an overhook and assist in dragging the opponent upright to where the frame clinch is most effective. Against a powerful clincher like Bagutinov one does not simple turn off the cage. What DJ did was use the frame clinch to create an angle on the cage before latching onto a plum clinch and pummelling Ali with a poo tonne of knee strikes to the body and head. The plum is a great striking position but is not very effective when your hips are square to the cage. 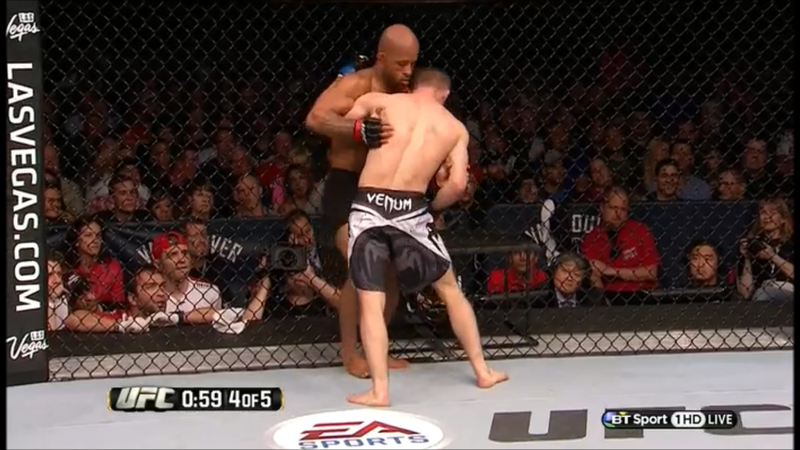 The frame clinch allowed DJ to angle out where the plum became much more effective. Here is a sequence which covers a tonne of the stuff mentioned above. When you have the Frame, plum or an intermediary version with your opponents back to the cage you are in a great position to cause damage. Not only are your strikes no longer hampered by chain link fence biting at your ankles and messing with your movement you are free to create real separation and land more long ranged attacks at will before crashing into your opponent once more. Getting this sort of rapid separation from grappler clinches is much more difficult as the opponent has over hooks to lock you to them. Another cool feature of clinch work that encourage a lot of knee strikes is that it tends to bring an opponents posture up as the try to avoid getting decapitated. Unfortunately for them this puts them in a great position to be double legged. DJ does a lot of other cool stuff with his clinch work, such as using double under hooks to move off the cage before transitioning to his vicious plum clinch or doing that cool Dekkers inspired jumping elbow thingy on Dodson, but I think we will leave it there. If you want to check out more have a look at the full video of clinch awesomeness below. This entry was posted in Uncategorized and tagged breakdown, clinch, demetrious johnson, wallwork by thegriphouse. Bookmark the permalink. Great write up. I don’t do MMA, but your observations are brilliant here. Then watch Cruz vs DJ… It’ll make ya head spin. Cool I’ll have a look today sometime. Cheers mate.